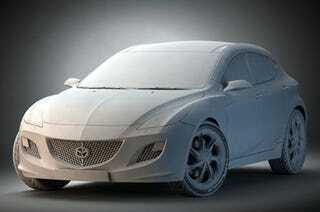 Remember yesterday's twin front and rear images of what we had assumed was the concept form for the 2010 Mazda3? Today we get nine full, high resolution walk-around photos of the handsome five door — and they're photoshopped. This amazing work was done by a chopper named Grif-1, and debuted on the Russian design site "Render." Grif-1 used 3D Studio Max and Photoshop CS3 to create a near-perfect execution of the Nagare design language, sprinkling in enough hints from previous concept cars it was easy to believe the car was real.